The Fall 2017 issue of American Racehorse (formerly Southern Racehorse) magazine is now available online by clicking here. 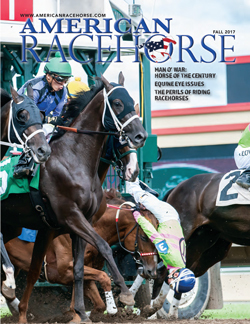 This issue of American Racehorse magazine features articles about the legendary Man o’ War on the 100th anniversary of his birth, a look at the perils of riding racehorses with some amazing photos plus much more. The issue also includes racing and breeding news from Texas, Oklahoma, Arkansas, Indiana, Iowa, Minnesota, Michigan, Ohio and around the region.